Toro (登呂遺跡) is an archaeological site located in Shizuoka. The historical remains of Toro date back to Yayoi period, the 1st century. It is registered as the special historical site of Japan. 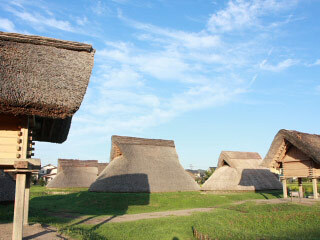 There are ruins of houses, storages and farms of ancient Japan. On those ruins, the buildings are restores and became the open field museum. Museum: 200 yen for Adults. Close: Monday and next day of holiday. 0. at south bus terminal of Shizuoka Station. Toro is an archaeological site of Yayoi period located in Shizuoka city, Shizuoka. Yayoi period is between 300 B.C. to 250 B.C.E. There were 12 houses, 2 storages and farm. It was found in 1943. There are ruins of houses, storages, farms and wells. Also, many historical relics were found in this place. There is a museum that you can experience the life of Yayoi period.